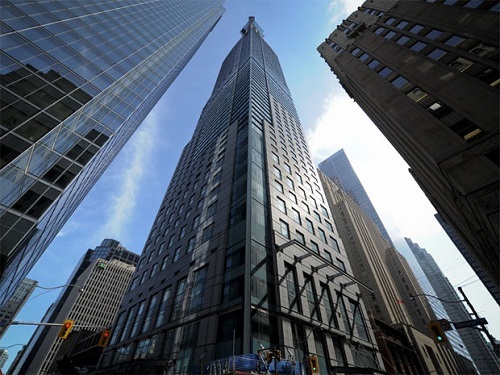 Real estate and investment services group CBRE has been tasked to sell the Trump International Hotel & Tower Toronto, now up for sale with an initial asking price of $298 million. The 65-storey luxury property, which boasts of 74 residential units and 211 hotel units, was listed for selling after the tower’s developer did not fulfill its loan obligations. Afterwards, the building fell into the hands of CBRE, the court-appointed receiver. “Opportunities to acquire such a prominent trophy asset in Toronto’s financial core are extremely rare,” CBRE Hotels executive vice president Bill Stone announced in a press release Wednesday (January 11), as reported by BNN. CBRE’s year-end estimates pointed at a strong 2016 for Toronto hotels, with the downtown area poised to exhibit a 10.3 per cent increase in average daily rate and a 15.6 per cent rise in revenue per available room. 10 Years ago, toronto didn't have a single 5 star hotel, suddenly they are all here. With our tax system, I don't think the market is here for that segment. It would be great if the Peninsula Hotel Group picked this up.